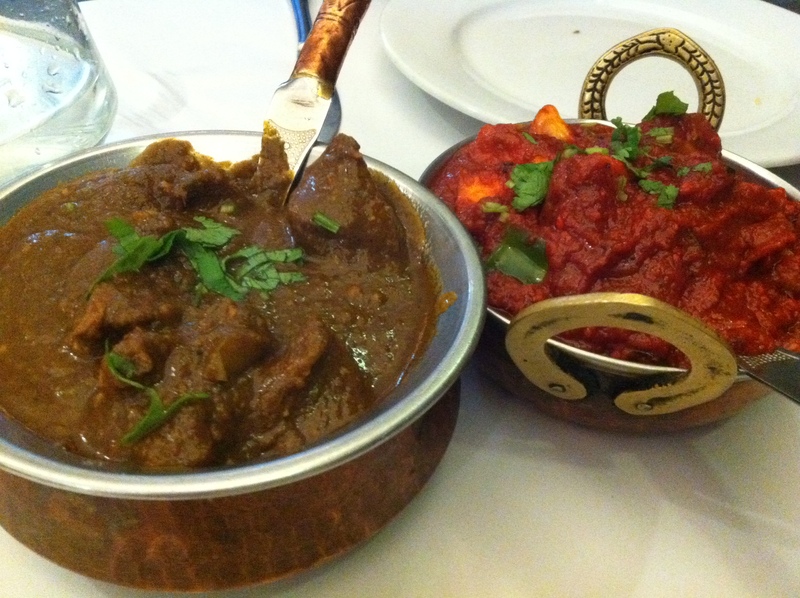 Banjara’s Indian Cafe is Mr Behemoth’s all time favourite Indian restaurant in Melbourne. When he was studying at Monash Caulfield and living in the area, I gather there were a LOT of trips there and a lot of curries eaten. Malvern is not exactly on our daily routine so we don’t get over there much. Wow. That was pretty full on. 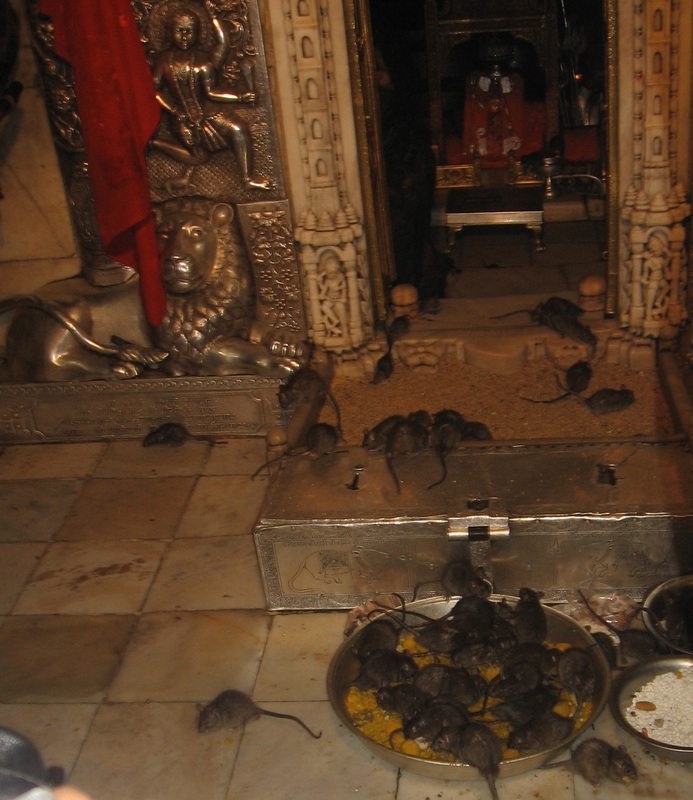 You have to remove your shoes to go into temples in India, so we had nothing protecting our feet except socks, and as we walked in, there were rats everywhere.Ganesh (Hindu god) is an elephant who rides around on a rat, so this temple is dedicated to his noble steed. They feed them offerings of laddu (and other Indian sweets) and big pans of milk that you see the rats all lying around and lapping up. They also run across the floor and are not shy about running right up to your feet, over your feet etc. One Indian lady nearly had a heart attack from panic and flat out refused to enter the temple, and it was pretty sad because she obviously clearly wanted to go in, but just was quaking in her… socks. Luckily (as far as I know) Banjara’s Indian Cafe is not suffering from a rat infestation. The restaurant itself always seems a little quiet when we’re there. 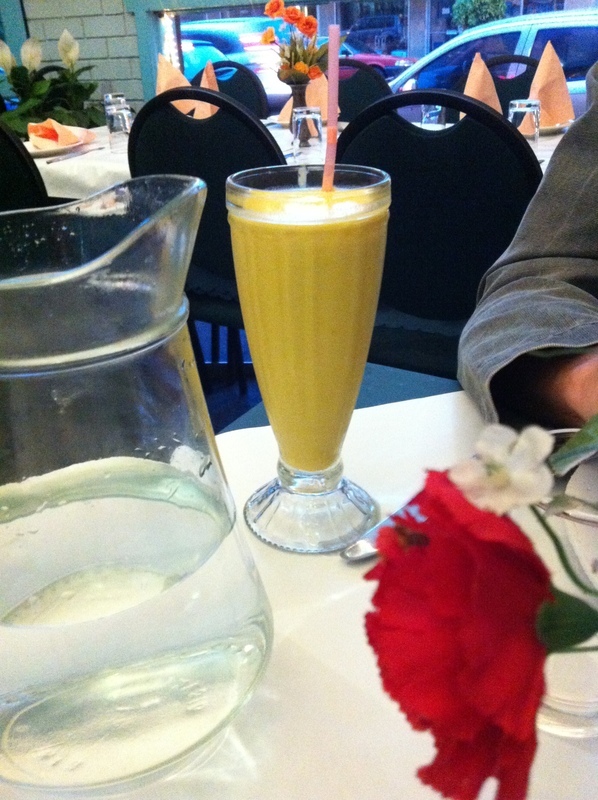 The inside is fairly typical Indian restaurant – a little dated, nice white tablecloths and colourful fake flowers. Mr B always, always orders kadhai paneer (fresh cheese in a spicy tomato gravy) in any Indian restaurant. Because I like a balance, this then restricts me from ordering my favourite, which is palak paneer (paneer in a spinach gravy). Rarr, the curse of the foodie who wants everyone to order different dishes and flavours! On this occasion, I ordered lamb saag (lamb in a spicy spinach gravy) because I still wanted a spinach-y dish to mix up the flavours. Side note: I love the little dishes that Indian food comes out in. We also ordered my standard order at Indian restaurants, “maximum naan”. It’s not really maximum naan, it’s just that I really, really love Indian flatbreads over rice. So I always beg my dining partners to order heaps and heaps of naan, or paratha, or roti, or chapatti. Maximum naan - we also got aloo paratha (not shown) - carb fiends. The naan was good, crispy yet chewy. Aloo paratha I always find a bit heavy (is it the double carbs, potato inside flatbread? Most likely) and this was no exception, but if you like it, order it – it won’t disappoint you. I like methi paratha (flavoured with fenugreek) or pudina paratha (flavoured with dried mint) better. We also got complimentary pappadams at the start of the meal. In the background - the red string blessing Mr B & I accidentally got at a Cambodian temple still clinging on Mr B's wrist two months later! 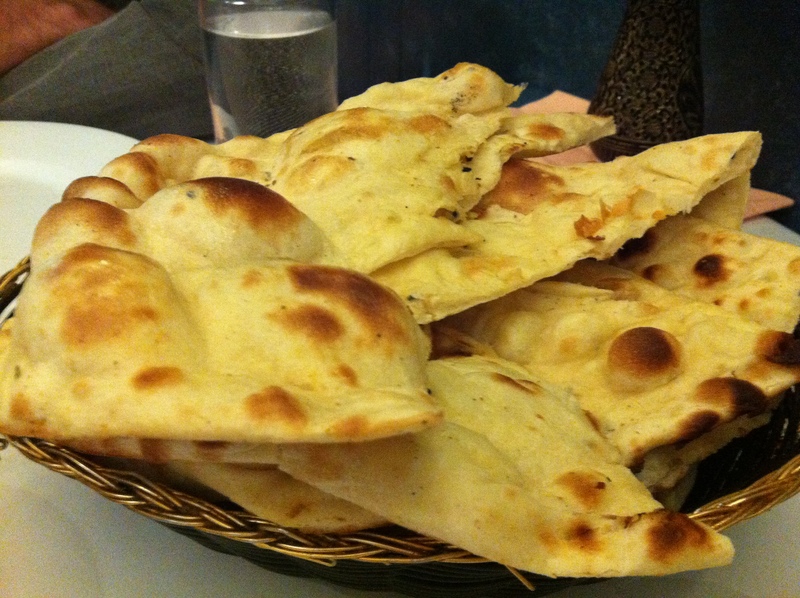 Naan – made with white flour and yeast (so, leavened). Cooked in a tandoor oven. Generally tastes less greasy although often brushed with ghee by the time it gets to you! Kulcha – like naan, leavened bread, but made with very fine maida (highly processed white) flour. 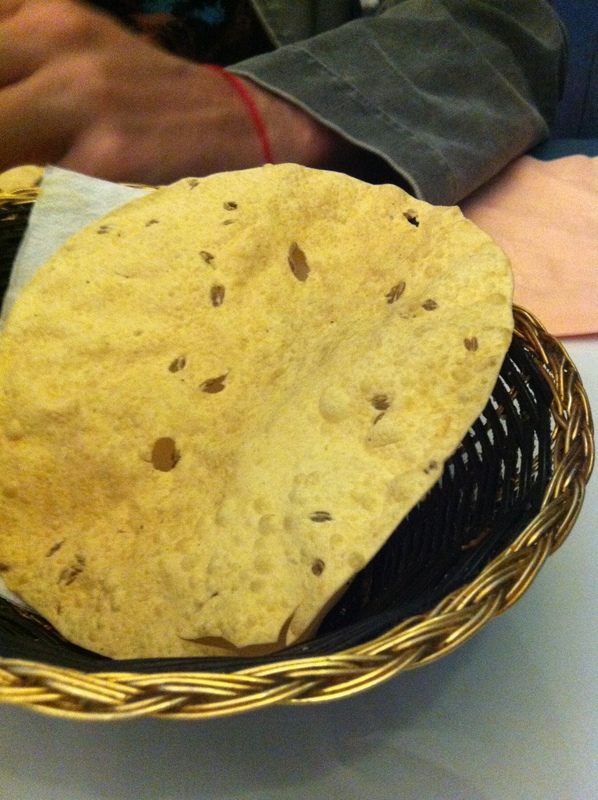 Amritsari kulchas are famous – I ate one just about every day I was in Amritsar for breakfast. Yum. Paratha – made with wholemeal flour. Flakier dough due to more layers. Usually fried with oil in a pan so seems greasier. Chapatti – made with wholemeal or chickpea flour. Very flat bread. Cooked in a pan. Roti – usually a bit thicker than chapattis. Can be flakier. Also a bit of a catch-all word for breads. Roti and prata (paratha) are generally the words used in Malaysian cooking as well. Puri – amazing thing that puffs up into a huge ball, deep fried I think, SO bad for you but delicious. Also can be called bhatura (if you want to order a giant one). Wow, that was a bit of a digression. Sorry about that! So – to the food. 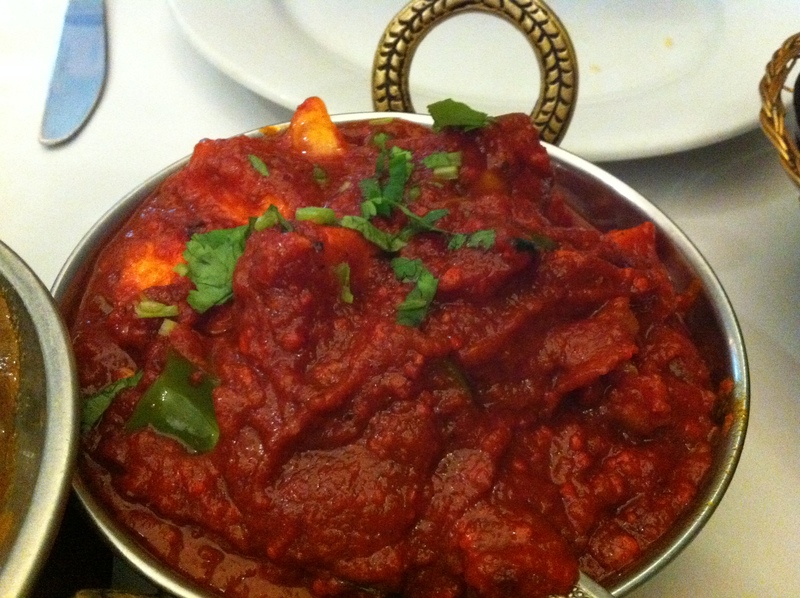 The kadhai paneer was a very good example of kadhai paneer. I don’t love this dish as much as Mr B. The flavours were all there though (tomato, capsicum, coriander, cumin, fenugreek) and the paneer was squidgy and yummy as always. The lamb saag however – well. This dish can be very variable. What we got was not very spinach heavy at all, in fact I could barely taste it in the sauce. What was excellent were the slow cooked pieces of lamb that were falling apart in the spoon. 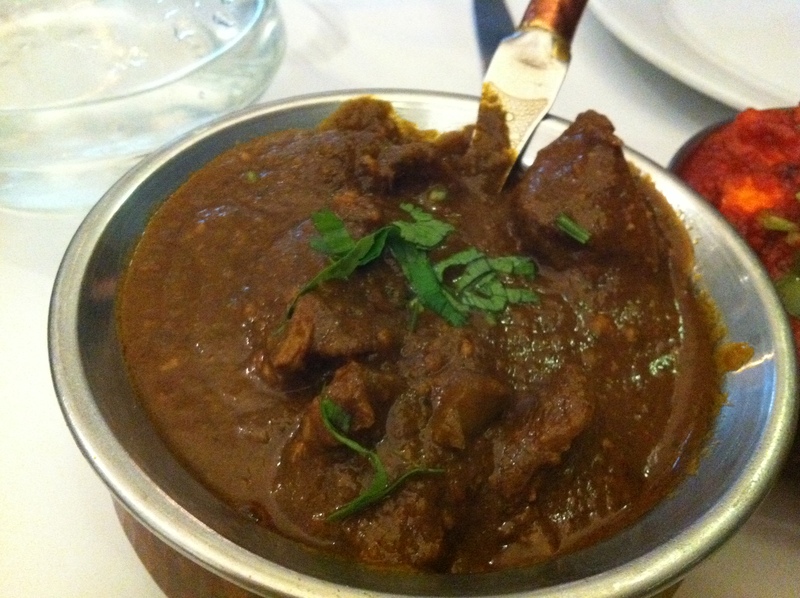 The gravy, whatever it was – honestly I thought perhaps the waiter had misheard me and brought out a different lamb dish – was excellent, spicy and perfect for mopping up with our maximum amounts of naan. Sure, it may not have been what I was expecting – but it was goooood. Lamb saag... or is it?! Also on the menu are a selection of Indo-Manchurian dishes (which are, essentially, India’s version of Chinese food). I personally didn’t like this genre when I ate it in India – imagine Chinese food with a hint of curry, really – but many people have fond memories of these dishes, particularly my Indian friends who ate this out for a treat in their childhood. The service at Banjara’s is friendly. I would be very happy to have this as my local although I’m not sure it’s worth crossing town for. If you’re in the area or passing by, though, definitely give Banjara’s Indian Cafe a go. Tags: cheap eats, indian, lamb saag, maximum naan, paneer. Bookmark the permalink.